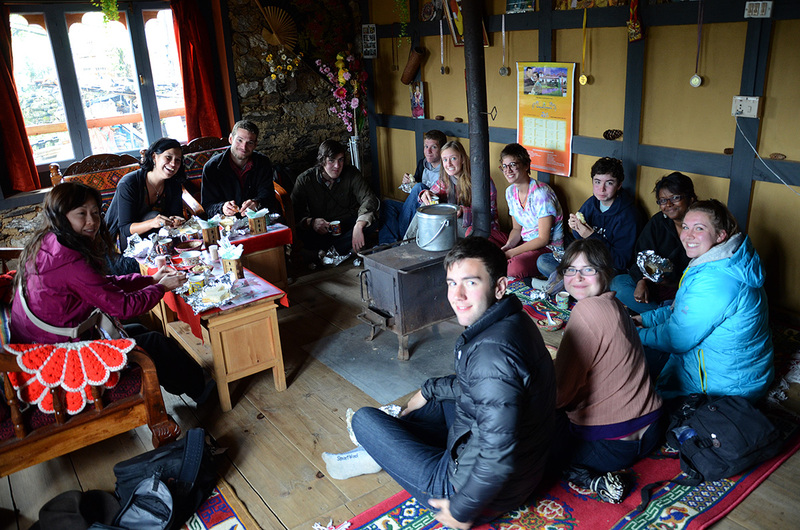 Spring Break trip was not your typical go-to-a-warm-climate, imbibe a bunch of sprits, and run streaking across the beaches screaming, “I love College.” In fact, this spring break trip, as many of the other trips that we have taken, involved visiting many dzongs and lhakhangs. 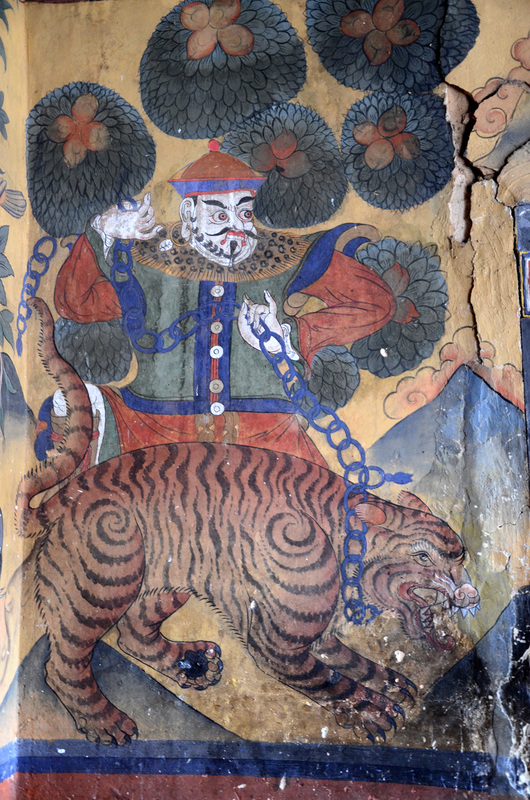 In fact, most trips that we have taken since the beginning of our stay have included visits to lhakangs and dzongs. 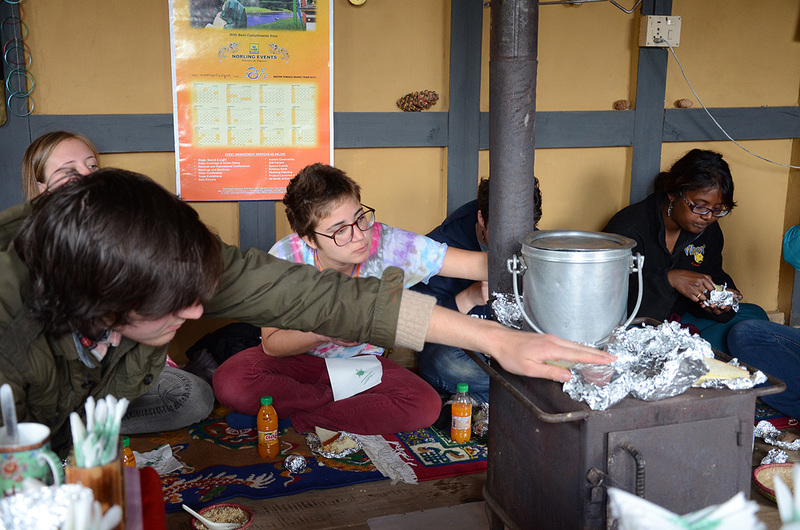 We may even become lhakhang “masters” by the end of our stay. It was a rainy, murky day, with the portentous fog lurking through the mountains tops exhibiting the signs of an auspicious day. 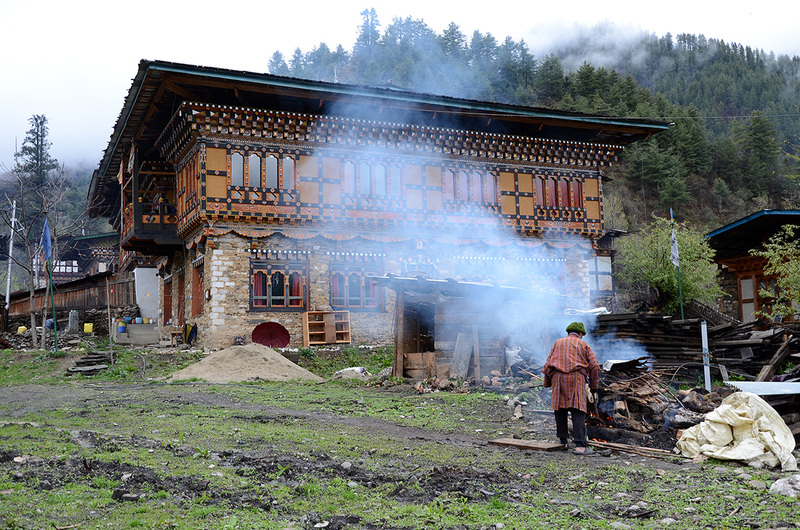 It should be noted that Bumthang is considered the cultural cradle of Bhutan because it is where Guru Rinpoche went to spread his teachings. Having obtained this knowledge, we were off to bask in the good karma that the lhakangs could offer us. 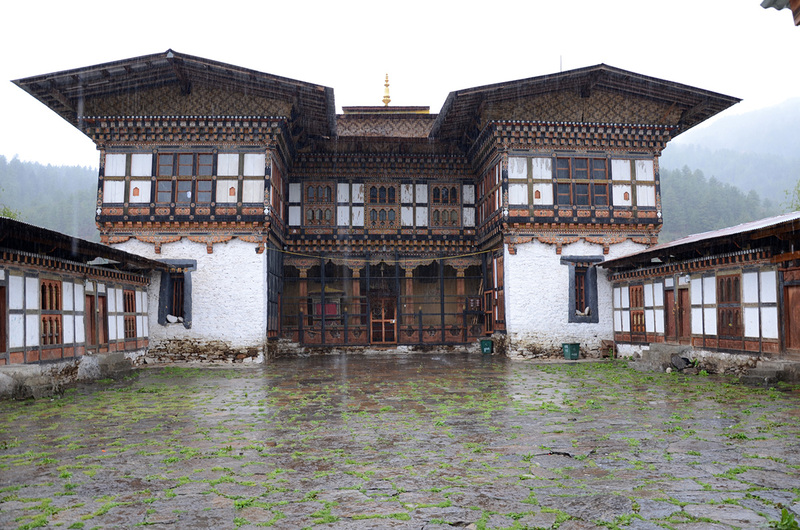 Our first stop was Jampa Lhakhang, which is one of the most sacred Lhakhangs in Bumthang. This Lhakhang is said to have been built by the Tibetan King, Songten Gampo on the left knee of a demoness that was obstructing the spread of Buddhism in the greater Tibetan region. Jampa Lhakhang, along with Kyerchu Lhakhang in Paro, which we visited on our second day in Bhutan, was one of the one hundred and eight lhakhangs that he is said to have built in a single night. Though originally built in the 7th century, other parts have been annexed over the years. Of course, the lhakang was surrounded with prayer wheels on the outside pillars. Each of the four corners of the lhakang had four different colored chortens. Once inside, still dripping with rain, happiness, and enthusiasm, we enter the sacred shrine. We saw a shrine of Shakyamuni Buddha and the Three Buddhas (of the past, present and future). We spent some time inside looking at the different paintings on the walls trying to recall the stories that they told. Given that we didn’t remember much of the stories, this took some time. Once sufficient time had been spent in mental meditation and contemplation, it was time to leave. There were more religious institutions to be seen; time could not be wasted! Next on our whirlwind tour was Kurjey Lhakhang, which is one of the sacred places of Guru Rinpoche (as mentioned by the sign outside the building). Upon entering, we crossed over the muddy road and went over the wooden ramp into the monastery where three towering white buildings stood in front of us; an auspicious number, might I point out. A coincidence? I think not. Once inside the shrine, we saw images of the Buddhas of the past, present, and the future. The shrine room included a statue of Guru Rinpoche and his two consorts. Behind the figure of Rinpoche, there was an imprint of what was said to be Guru Rinpoche’s body. Each of us took a turn looking at the imprint. Tsewang was adamant that we be sure to see it, not only to correct our ever-deviating moral compasses, but also because this is one of the most holy places in all of Bhutan. Also around the walls were one thousand statues of Guru Rinpoche. Additionally, there was a clay structure of Guru Rinpoche that was said to one day come and speak when it felt there was a need to do so. We also spent our time in this shrine soaking up all the holiness that was offered. Even with the ice like nature of the floor, we could not manage to leave his holy sight without much contemplation. Behind the first building stood a rather large Cyprus tree that was said to have sprouted from Guru Rinpoche’s walking stick. The second building was located in the middle of three lhakhangs and was built by the first king. It was prophecized that if the soon-be-king could build a shrine for Guru Rinpoche, he would become the king (hence the temple). Inside, it held a two story high monument of Guru Rinpoche. Though we could not enter the room that held the giant statue, we could look down on it from the second story and admire the jewels, cloth, and offerings that adorned the giant statue. From the second story shrine we could see that there were one thousand miniature statues of Guru Rinpoche that encased the room. 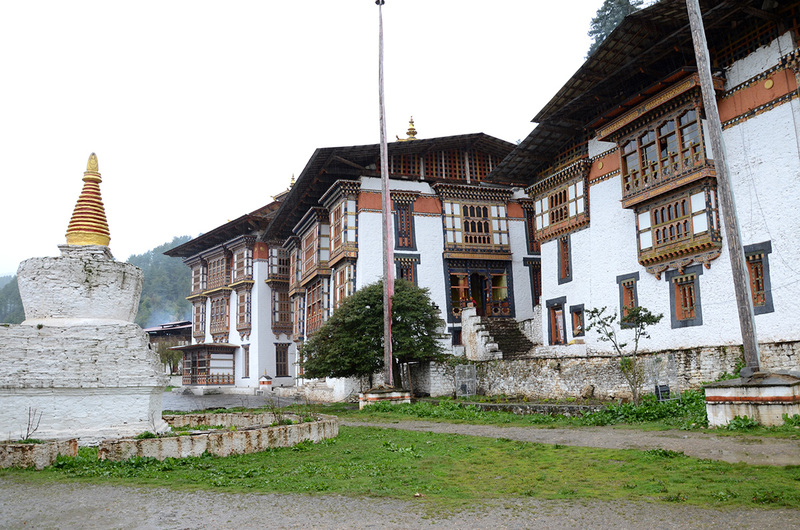 They were donated from a man who used his pension funds for the up keeping of the lhakhang. The statue of Guru Rinpoche was the biggest that we had ever seen in Bhutan, however we unfortunately could not get a closer look at it because the first floor was locked. The third building was constructed by order of the royal grandmother of the present King. We were told that no one other than royalty could enter the third building, so unfortunately, that was off limits to us. 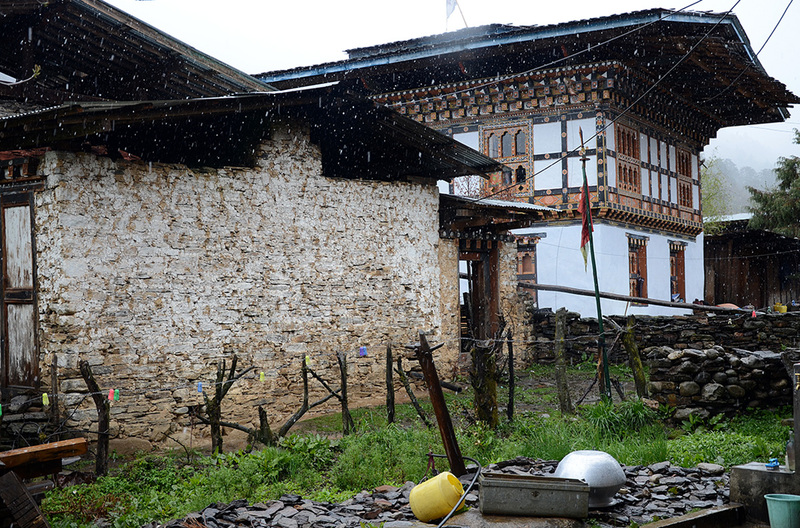 Our third lhakhang visit that day, an auspicious number of course, was Thangbi Lhakhang. 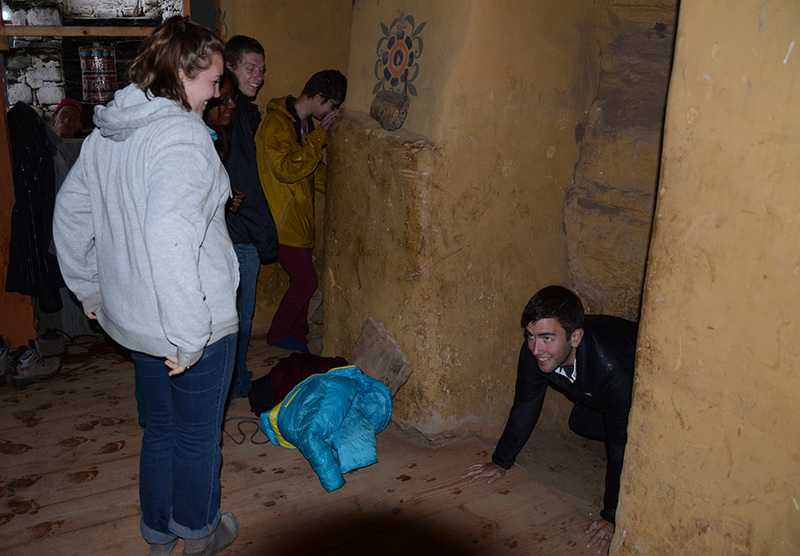 We hustled through the courtyard dodging the bullets of rain to enter the shrine room. Upon discovering that the caretaker was not in, we let ourselves in. Once again this room led to images of the Buddhas of the past, present, and future, as well as a statue of the Lord of Compassion and another of the Lord of Confession. Being the adventurous group that we are, we let our selves out and headed toward the bus.